Today, Congressman Patrick McHenry (NC-10), joined with House Republican Committee Leaders to send a letter to Speaker of the House Nancy Pelosi (D-CA) urging her to direct the Democratic Chairmen of the committees of jurisdiction to schedule hearings on the Green New Deal. 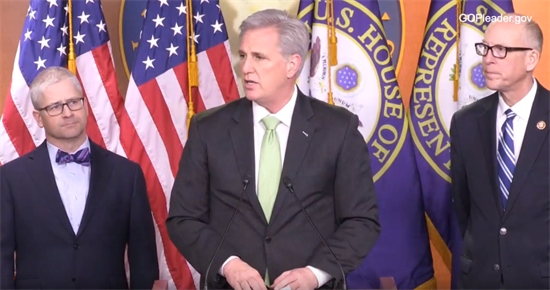 Later Thursday, McHenry joined a press conference on the Green New Deal with Leader McCarthy and other Ranking Republicans on House Committees. During the press conference, McHenry highlighted how the proposal included in the Green New Deal would drastically increase housing costs in western North Carolina and throughout the country. Click here or on the image below to watch this morning's press conference.